Spring brings warmer temperatures and sunny days. Gardeners get an itch to start digging in the dirt! 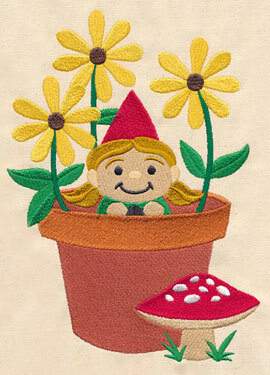 New designs let you plant colorful and creative stitches onto pillows, totes, wall hangings, table linens, and more. Subjects and styles range from realistic garden tableaus to giggly, cartoon bugs and gnomes. 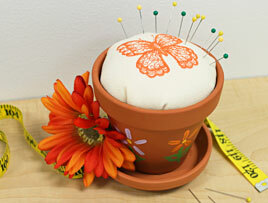 with this clever flowerpot pin cushion! 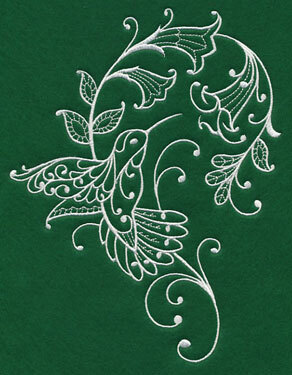 Elegant one-color designs are dramatic and eye-catching. 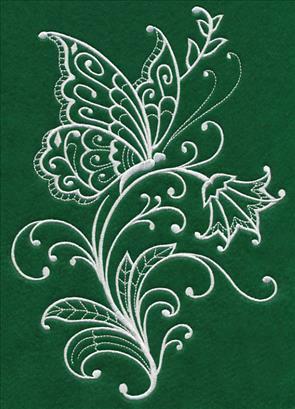 Traditional whitework, in spring themes, bring a fashion-forward look to t-shirts, quilts, and table linens. 6.85" x 9.54" and 5.62" x 7.83" and 4.85" x 6.75"
These designs are filled with graceful lines, whirls, and swirls! 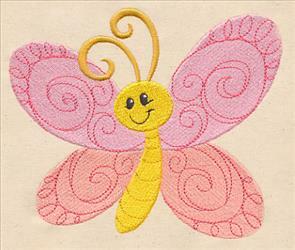 Butterflies flit and flirt among flowers, ready to land on quilt blocks, tea towels, and wall hangings. 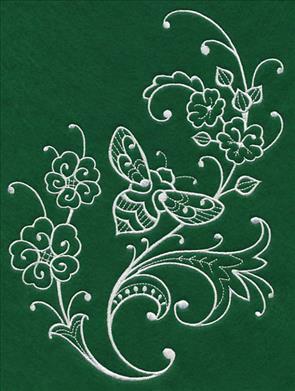 We embroidered the designs in white on dark green fabric. Experiment with different fabric and thread colors to find the look that you love. The designs do have delicate lines, so choose neutral fabrics (no busy prints) for best results. 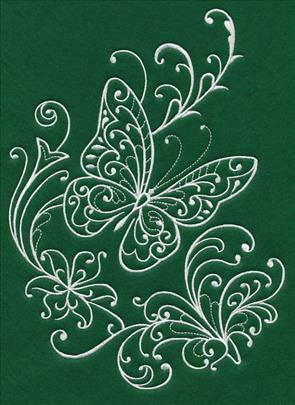 These elegant and graceful designs use only one color, making them quick to stitch on garments and home decor. Choose your favorites by using the links above, or get all six in a design pack! Colorful garden scenes are framed in elegant whirls and swirls. 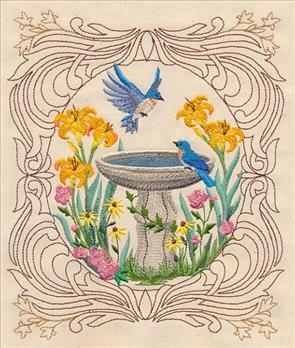 Bluebirds prepare to take a bath, and a watering can is filled with beautiful flowers in full bloom. These designs are stunning additions to pillow covers, tote bags, and wall hangings. 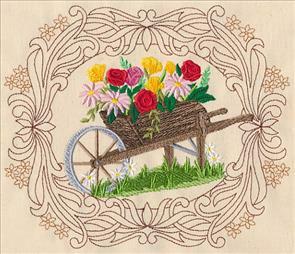 6.57" x 7.80" and 5.90" x 7.00" and 4.90" x 5.81"
Add a wheelbarrow with flowers to pillows and flower-themed wall hangings! 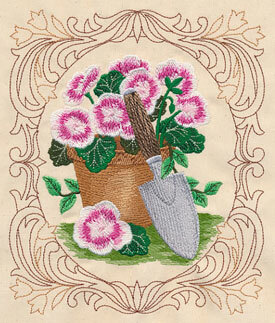 And, a pot of geraniums with a trowel is a lively addition to tote bags for gardeners. 6.57" x 7.80" and 5.90" x 7.00" and 4.85" x 5.75"
A trio of terracotta pots, each filled with flowers, is a lovely arrangement for pillows and totes. Brighten up walls with framed pieces, too! Those that love to dig in the dirt will adore this colorful scene. 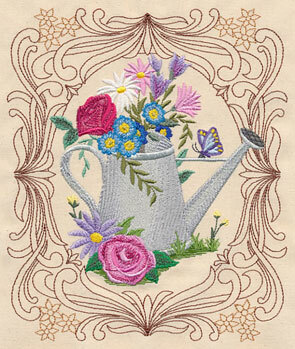 7.77" x 6.56" and 6.93" x 5.85" and 5.75" x 4.85"
Light-stitching flowers grow beautifully on pillow covers, placemats, and quilt blocks. 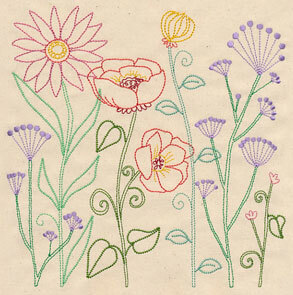 These designs are airy and open; easy-breezy stitching! 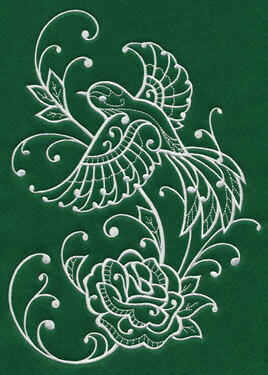 They're stunning on quilter's cotton and linen. 7.83" x 7.81" and 6.87" x 6.85"
7.83" x 7.83" and 6.85" x 6.86"
5.86" x 5.86" and 4.85" x 4.85"
The tall flowers and square composition is an excellent fit for quilt blocks, tea towels, placemats, and table runners. Change the colors to coordinate with your home decor or personal preference! 7.83" x 7.80" and 6.88" x 6.85" and 5.87" x 5.84" and 4.88" x 4.85" and 3.87" x 3.84"
A gardeners' word of wisdom is surrounded by colorful flowers. 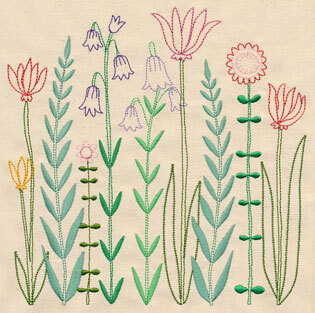 Plant this design on pillows, totes, and wall hangings. Bring a bright and summery look to your home decor! 11.72" x 6.53" and 9.39" x 5.24" and 7.80" x 4.35" and 6.88" x 3.83"
Stitch this design onto pillow covers and jacket backs, and you're sure to get smiles! 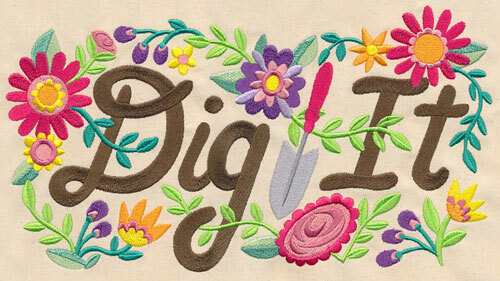 The words 'Dig It' are separated by a trowel, and encircled by flowers in lively colors. 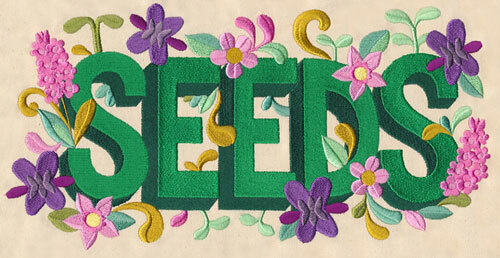 11.74" x 6.33" and 9.39" x 5.06" and 7.79" x 4.21" and 6.86" x 3.71"
Make a statement with seeds! 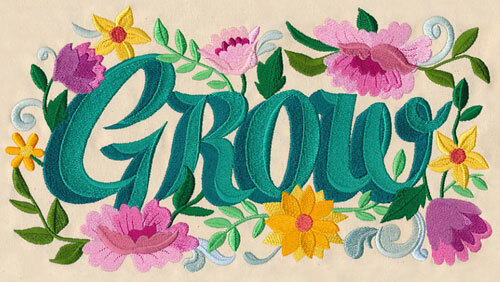 The word is surrounded by colorful flowers and baroque elements. 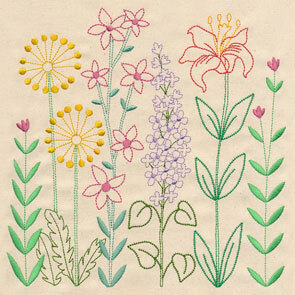 This design is eye-catching on totes for the farmers market, and gifts for gardeners, too. 11.72" x 5.92" and 9.38" x 4.74" and 7.81" x 3.95" and 6.87" x 3.47"
Advertise your flowers, fruit, and vegetables, as "homegrown" with this design. 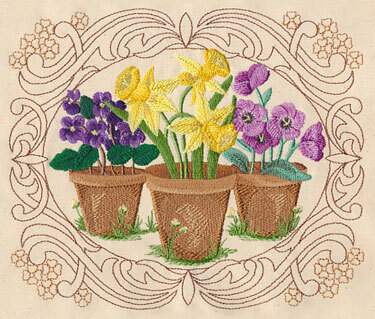 Beautiful on totes, mini-quilts, and wall hangings. 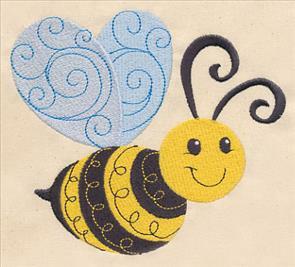 11.75" x 5.06" and 9.40" x 4.04" and 7.81" x 3.37" and 6.86" x 2.95"
A cheerful bee and smiling butterfly have delicate doodles in their wings! 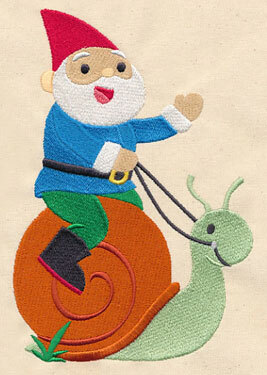 These designs are sweet on bibs, blankets, shirts, and quilts for little ones. 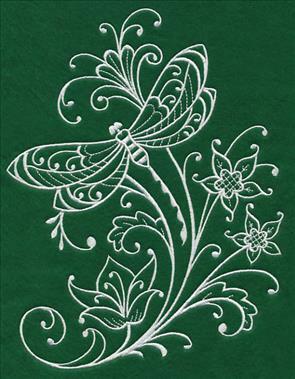 5.76" x 4.87" and 3.86" x 3.26"
Dragonflies and ladybugs will fly right to your projects! 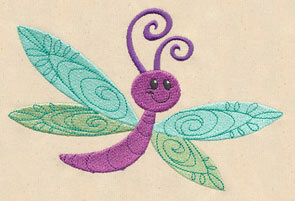 Stitch these colorful and friendly bugs onto pillows, quilts, bibs, t-shirts, and more. 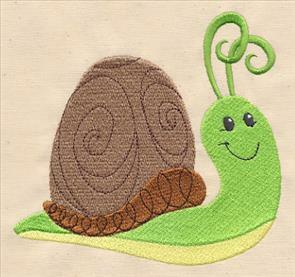 5.54" x 4.86" and 3.86" x 3.39"
A snail and caterpillar are friendly fellows, and an excellent way to add spring fever to baby bibs, play mats, and cloth books, too. 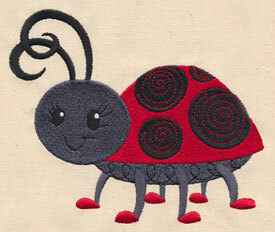 4.85" x 6.26" and 2.99" x 3.86"
Sweet and smiling bugs are delightful additions to baby items and garden-themed quilts. Choose your favorites by using the links above, or get all six in a design pack! 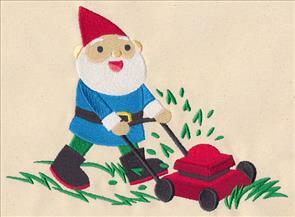 Gnomes are classic fixtures in yards and gardens. 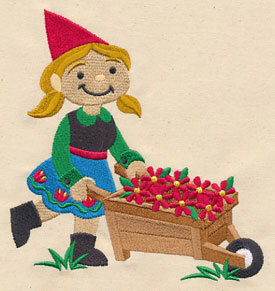 Their sweet smiles and humorous antics make them beloved to gardeners everywhere! 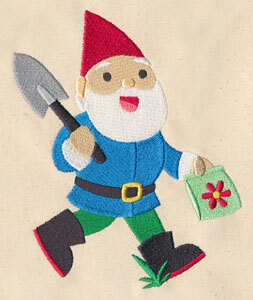 These designs feature helpful gnomes, ready to dig in the dirt and make your garden grow. 4.53" x 5.77" and 3.74" x 4.76" and 2.36" x 3.00"
These little creatures are small enough to ride a snail, and play hide-and-go-seek in flowerpots! 5.55" x 7.66" and 4.58" x 6.32" and 2.79" x 3.85"
Along with playing in the garden, gnomes are hard workers, too. Here they mow lawns, and deliver a wheelbarrow filled with flowers. 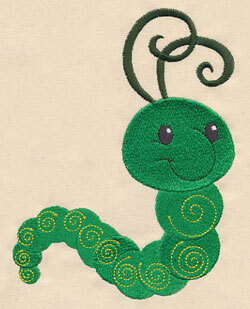 5.87" x 6.18" and 4.86" x 5.11" and 3.43" x 3.61"
Add these sweet garden critters to pillows, quilts, tote bags, and more! 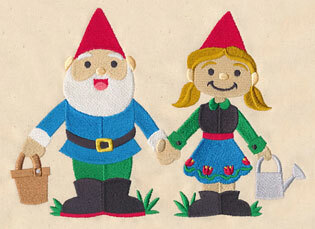 Choose your favorites gnomes by clicking the links above, or get all six in a design pack! 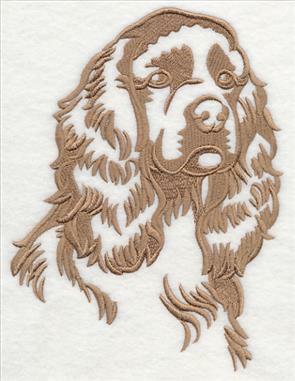 The American Cocker Spaniel is a beloved breed. 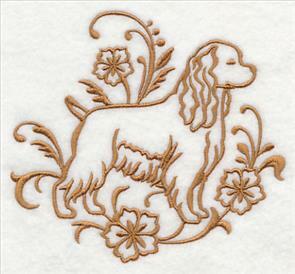 Marion, Lynn, Jeanne, and dozens more have written in to request this dog in the graceful, classy canine style. 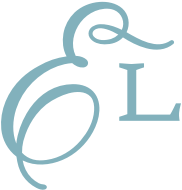 Two versions are below; one has a long tail, the other a docked tail. 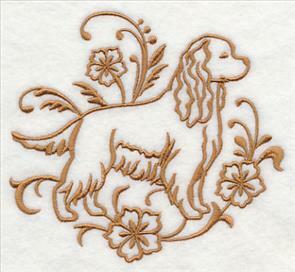 The designs use one color thread, making them quick to stitch on dog-loving garments and home decor items. 5.32" x 4.86" and 3.86" x 3.53"
This one-color silhouette design is a bow-wow-wonderful way to dress up totes, pillows, and sweatshirts for dog lovers. Thanks to all who requested this design! 5.86" x 7.73" and 4.89" x 6.45" and 2.94" x 3.87"